We don't need anymore proof that the Boy Who Lived is the coolest, but Daniel Radcliffe just keeps reminding us anyway. The British actor makes a really bad receptionist, but when it comes to covering Eminem, Radcliffe slays. Along with his girlfriend, Erin Drake, the former Harry Potter sang "The Real Slim Shady" during a karaoke session at Cameron's Pub in Half Moon Bay, Calif. and officially confirmed his baller status. Luckily for Potter fans, this is far from the only time Radcliffe has proved that he's basically amazing. The video hit YouTube on July 18 (below), but it's not clear exactly when this stellar performance was filmed. What I do know is that Radcliffe's rapping skills are positively on fleek. As the music kicks off, Drake starts throwing down some serious dance moves, while Radcliffe announces, "May I have your attention, please? Will the real Slim Shady please stand up?" It's everything I ever wanted in a mid-'90s throwback. As any fan of Em's know, the song's lyrics don't hold back. Not only is it filled with rapid-fire verses, but also some pretty controversial content. However, Radcliffe doesn't hold back, giving the audience his best Eminem impression. And yes, at the actor's urging, the audience was up on their feet. This isn't the first time Radcliffe has wowed me. In fact, he slays on pretty much a regular basis. In honor of his mad rapping skills, here are seven more times he proved how awesome he is. During an interview, Radcliffe was described as being an "unconventional" male lead because of his Harry Potter role. His reaction to the journalist? "My immediate response to that was: 'Well, the male population had no problem sexualizing Emma Watson immediately.'" 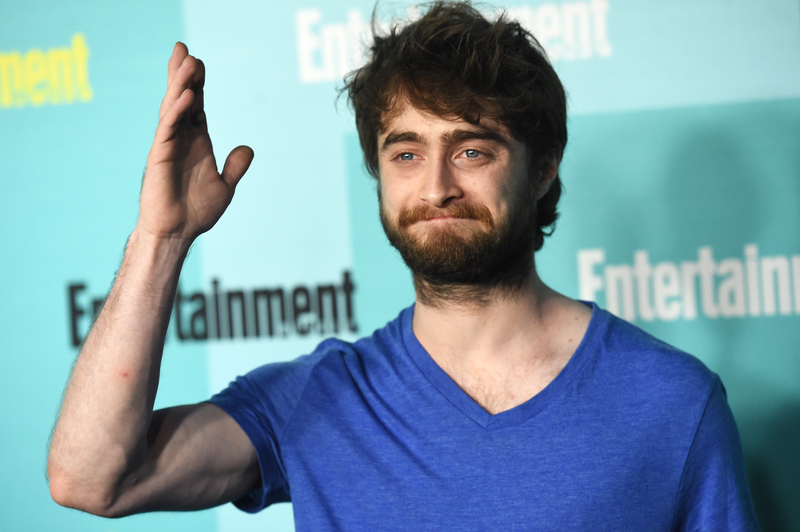 "If I left you as you are now, no one would ever talk to you," Radcliffe said mid-haircut. Humorous and questionable hair-cutting skills, FTW. His explanation: "Because she's awesome and awesome people go to Gryffindor!" Apparently wearing the exact same outfit every day renders photos valueless. When He Rapped "Alphabet Aerobics"
Radcliffe has a long history of owning iconic songs. More proof that his sense of humor is flawless. Because I'll always associate Radcliffe with this incredible moment.